(CBS/AP) OAKLAND, Calif. - A gunman opened fire at a Christian university in California Monday, killing at least seven people and wounding as many as 3 more, authorities said. Police say they have a suspect in custody. Police have identified the suspect as a 43-year-old Oakland man named One L. Goh, who is in custody after surrendering at a shopping center about an hour after the shooting at Oikos University on Monday morning. Authorities say he was a former student at the Christian school. The deadly shooting erupted around 10:30 a.m. at Oikos University in Oakland, according to officials. Police in nearby Alameda told KCBS that the suspected gunman was taken into custody in the parking lot of the Safeway store at about 12:20 p.m.
Police believe the shooter acted alone, though they have not discussed a possible motive. Those connected to the school, including the founder and several students, described the gunman as a former nursing student. Officer Johnna Watson said the suspect is an Asian male in his 40s and was taken into custody at a shopping center in the neighboring city of Alameda. Watson would not confirm if he was a student. Authorities earlier described him as a heavyset Korean man in his 40s wearing khaki clothing. "I can confirm that we do have one person who has been detained that we believe is possibly responsible for this shooting," Watson said. 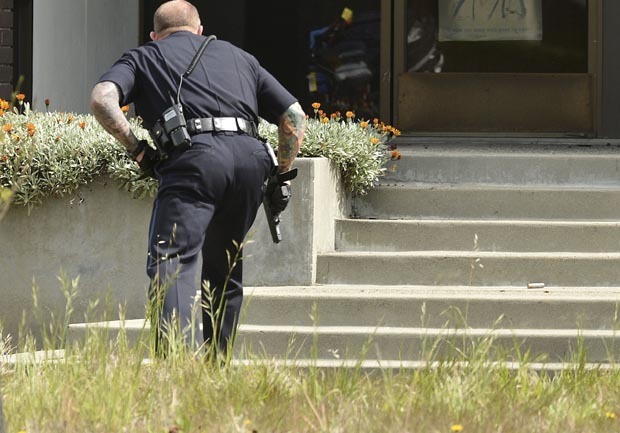 KTVU-TV reported that the shooter opened fire in a classroom. Following the shootings, CBS San Francisco video showed a chaotic scene as heavily armed SWAT officers swarmed into the building and bloodied victims were carried out on stretchers and loaded into ambulances. Several bodies covered in sheets were laid out on a patch of grass. Police also evacuated nearby businesses, and agents with the federal Bureau of Alcohol, Tobacco and Firearms arrived at the scene to assist with the investigation. Pastor Jong Kim, who founded the school about 10 years ago, told the Oakland Tribune that the shooter was a nursing student who was no longer enrolled. He did not know if the shooter was expelled or dropped out. Kim said he heard about 30 rapid-fire gunshots in the building. Deborah Lee, who was in an English language class at the time, said she heard five to six gunshots at first. "The teacher said, `Run,' and we run," she said. "I was OK, because I know God protects me. I'm not afraid of him." Angie Johnson told the San Francisco Chronicle that she saw a young woman leave the building with blood coming from her arm and crying: "I've been shot. I've been shot." According to its website, Oikos University offers studies in theology, music, nursing and Asian medicine. A telephone message left on the university's voicemail was not immediately returned.